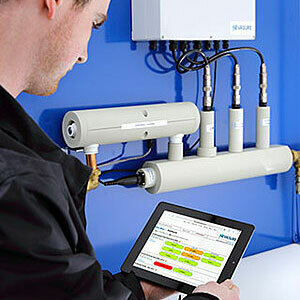 Product optimisation – correct chemical and non-chemical control may result in fewer chemicals / non-chemicals being used and better system control and lower operating / energy costs. We like to consider efficiency, effectiveness, life safety, system integrity and extending the capital equipment of plant. We like to think about water re-use, reducing total water usage and environment footprint. Please browse through the equipment support and innovations we are bringing to market which we believe are exceptional, proven and truly innovative in high quality water treatment control, safety and compliance. Intelligent compliance and system management solution for large closed systems and critical applications. Award winning, this is retro-fitted or can be hired to perform a system health check. 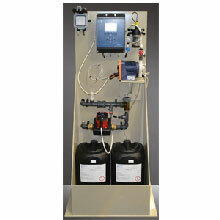 Highly effective non-chemical solution for <20m3 and upwards of 500m3 which is NHS approved and replaces old chlorine dioxide exchange units with smart, low operating cost, reliable, safe, clean potable water. Well regarded and particularly effective product known to kill pathogens in hot and cold water systems. Approved for potable water. NHS approved. 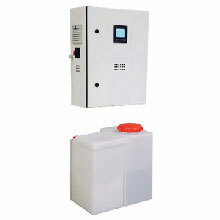 Available to shock dose and / or dose with a permanent or mobile dosing system.